The raw material and the care and attention with which we treat wood in GÁMIZ GROUP, ensures we are present in large-scale projects where quality is our hallmark. Always at the forefront of technology, we have managed to create unique products with great durability and resistance. 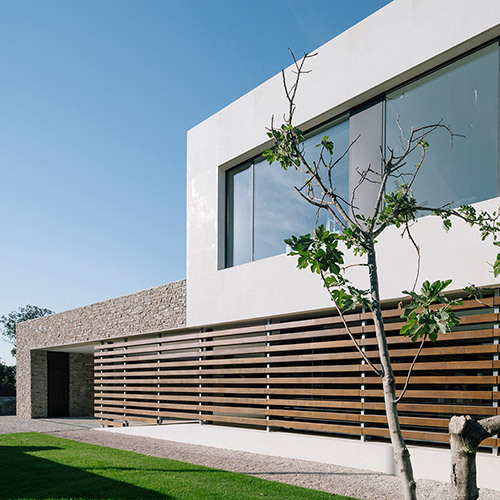 With finishes of great natural beauty, GÁMIZ GROUP products are designed for constructions and structures that require a superior design guarantee. GÁMIZ GROUP is known for being part of emblematic projects thanks to its high technology and quality products: VIGAM, glulam beams unmatched for strength and aesthetic results; PERFIGAM, laminated profiles of great beauty and natural character; ALIGAM, edge-glued wood panels to create an endless number of highly aesthetic universes; ACCOYA®, wood rich in durability, stability and sustainability; GEOLAM (WPC), composite flooring with great strength and resistance; GEOLAM PREMIUM (WHS), profiles that provide strength, safety and elegance to any project; and TAG, natural wood for the most demanding floors. GÁMIZ GROUP, added elegance for any project, finishes which speak for themselves, filling any space with life and sparkle. Our dedication and love for wood has made ELABORADOS Y FABRICADOS GÁMIZ, S.A. the first manufacturer of glulam hardwood beams worldwide with a CE marking. 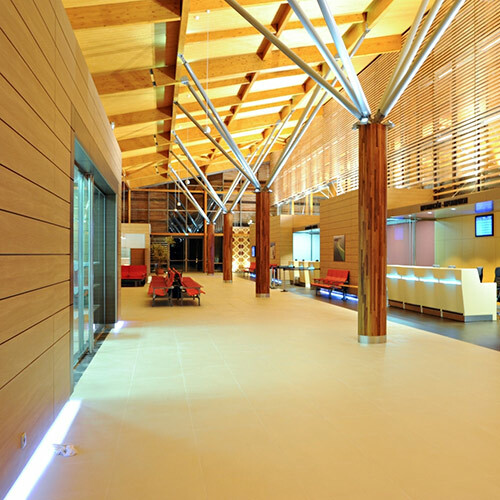 Oak, ash, iroko or radiata pine, the diversity of our glulam beams allows them to be used in different construction and architectural locations where high quality, elegance, beauty and well-being are required. As an example of major works created with VIGAM, noteworthy are the Astrazeneca Headquarters located in Cambridge, the New General Secretariat of the European Parliament in Luxembourg or the Cathedral of Santa Maria in Vitoria-Gasteiz. Elaborated with oak, pine and beech wood, GÁMIZ GROUP laminated profiles are excellent for the construction of any architectural project. PERFIGAM makes it easier for architects and wood artisans to play with its shapes and create perfect division drawings that convey an attractive and personalized elegance to any building worth its salt. An example of this is the Casa Buesa located in Vitoria-Gasteiz designed by the architect Luis Zufiaur. The edge-glued wood panels from GÁMIZ GROUP enable highly aesthetic universes to be created. Any construction made with ALIGAM can boast of cutting-edge technology and exceptional quality guaranteed by the rigorous quality controls to which these panels are subjected. This sustainable wood, rich in durability and stability, means it can be used on all kinds of exteriors due to its great resistance. Created from conifers, this solid wood, fruit of a studied process of acetylation, grants great sustainability to constructions as demanding as facades, claddings or external flooring. In addition to being able to replace the toughest tropical woods, this wood distributed exclusively by GÁMIZ GROUP admits opaque and translucent finishes, granting an extra special beauty to each project. 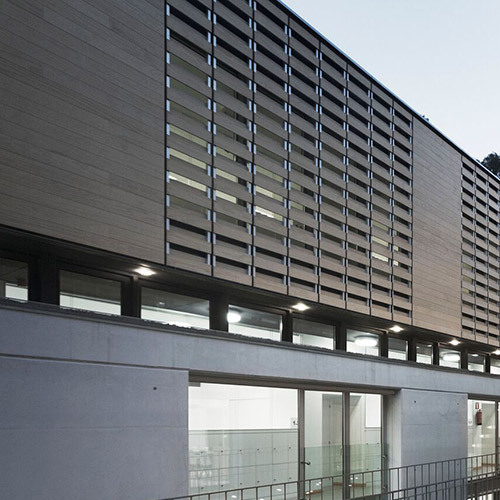 The magnificent properties and characteristics of ACCOYA® result in projects with refined finishes of great strength and beauty such as the Europa Congress Palace in Vitoria-Gasteiz or the Oak House School in Barcelona. GEOLAM, wooden and plastic flooring WPC (Wood Plastic Composite), distributed exclusively by GÁMIZ GROUP, stands out for its qualities of resistance, sustainability and naturalness, which makes it an excellent alternative to exotic woods on exterior floors and facades. Its composition based on natural fibres and polymers gives it very competitive strength and durability. It is anti-slip, does not creak, does not crack and is highly resistant to high temperatures, sun, rain and sudden changes in temperature. 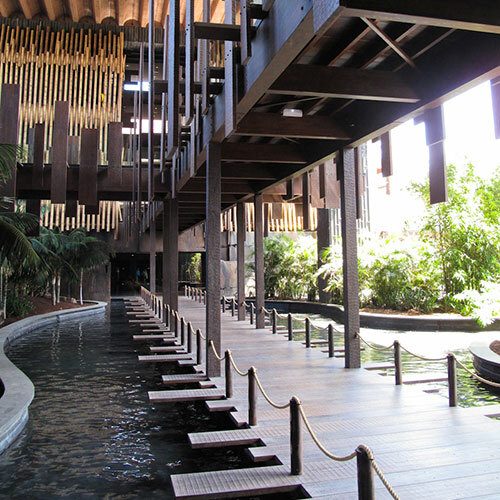 Its exclusive qualities have made WPC the material of choice for high-rise projects such as the Splau Shopping Mall in Cornellá, in Barcelona, or the Monte Igueldo Hotel in San Sebastián. GEOLAM PREMIUM, otherwise known as the Wood Hybrid System (WHS), are the hybrid profiles from GÁMIZ GROUP that combine wood composite with aluminium. In addition to amazing stability, GEOLAM PREMIUM offers unique characteristics: greater durability, minimal expansion, great lightness, and quality aesthetics. They are profiles that do not require any maintenance, their appearance is not modified by the passage of time, and can be curved to integrate perfectly in the architectural project of any work. In short, a high-end material whose quality increases the resistance and beauty of buildings such as the Ibiza Gran Hotel or the Style Outlet Viladecans, in Barcelona. At GÁMIZ GROUP we commercialize TAG exclusively, a product of great versatility for the creation of floors of all types of dimensions and designs. High quality and durability, this high-end platform offers greater stability to the building avoiding any shrinkage and expansion, and can also be installed in combination with underfloor heating. Due to its capacity to withstand very humid environments, it is considered by many professionals as the best option in outdoor or marine environments. Major projects in which TAG has been used, such as in the prestigious Gran Hotel Mandarin in Barcelona or the Bibat Museum (Archaeology and Playing Cards Museums) in Álava.